It would be great to avoid such a terrible audible feedback for users. The two cases are different though. title="Posts by Jeffrey Paul (@jbpaul17)"
that's a wrong information because the link points to the .org profile, not to the author page. 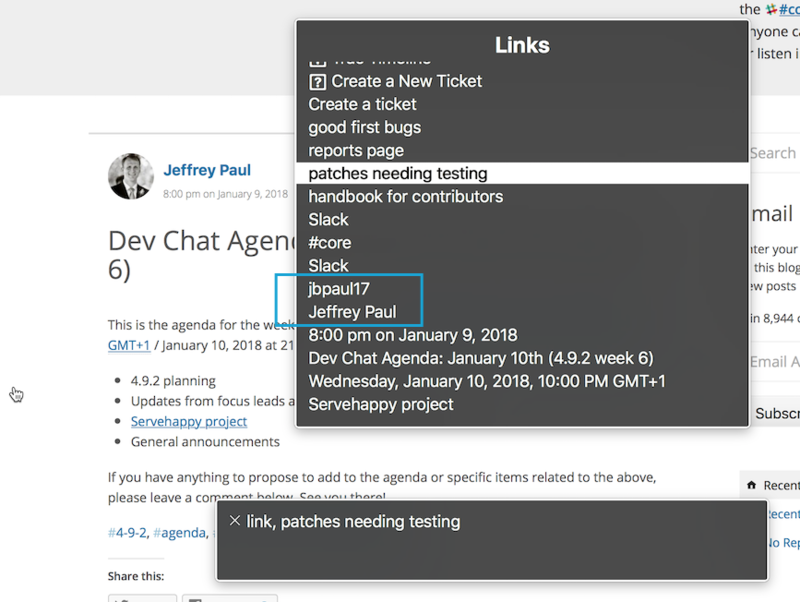 I'd suggest to either remove the title attribute or use something like title="see Jeffrey Paul profile"
Sidebar "Recent Posts and Comments"
Exposing just the "commented on" and date/time info is not that useful, it would be great to include the author name, if possible. I'd consider to put the image inside the link and use the author name as alt attribute. If this is not possible, then the image should stay not linked but it should use an empty alt attribute. Worth noting the "gravatar card" appears just on hover and is not available for keyboard users (luckily, I'd say). It guess the problem is related to a misuse of get_avatar( ) function all around wordpress-meta. alt parameter of this function seems always ommitted so there is almost no alt attribute at all. Fix get_avatar( ) use in all wordpress-meta repo by adding an empty alt parameter. I can work on both solutions. What do you prefer? Thanks @ocean90 . So let's roll! Thanks for the PR, @audrasjb! I've merged it, and deployed to WordPress.org. Additionally, the author image is still a link with an image with an empty alt attribute. Should preferably be merged with the author name in one link or have a meaningful alt text. @afercia Would the author display name be an acceptable alt attribute for that avatar? @obenland See %s profile or See profile: %s would be better because that's where the link points to. However, the ideal solution would be putting the image (with an empty alt ttribute) and name inside just one link, prepending some screen-reader-text maybe. Since o2 author link is actually linking to the author's posts (but not in w.org implementation of the plugin), I guess this is not an issue for Automattic/o2 but for w.org implementation of this plugin. I Guess we just need to use a filter to replace the title attribute used in w.org. But @afercia is alright, the current markup is not perfect, and can be improved both in o2 and w.org implementation of the plugin. See %s profile or See profile: %s would be better because that's where the link points to. As the image alt attribute? Not the link title? However, the ideal solution would be putting the image (with an empty alt ttribute) and name inside just one link, prepending some screen-reader-text maybe. I'd rather not do that. The user name doesn't get displayed on pages, and in all other cases we also have the entry date to deal with. Name title fixed in [dotorg13845]. O2: More contextual title for profile links. Yes, for a linked image the alt attribute is actually the link textual content. I'll let you decide, please just consider formal compliance can be ineffective if the links are not meaningful. See for example in the screenshot below: would you be able to understand where those two links point to when read out of context? Created a ​new pull request.